It is a well-known fact that Quebecers love to laugh. And this character trait is far from recent. When one thinks about it, the emergence of the "Juste pour rire" (Just for Laughs) festival 25 years ago marked the culmination of a process begun with the Frenchification of American burlesque by pioneers such as troupe manager Arthur Pétri and comedian Olivier Guimond (senior) during the 1920s. Thereafter, the genre gained in popularity. During the following decade, a good dozen theatres in Montréal capable of seating 8 000 presented burlesque shows. From the mid 1930s to 1953, the Théâtre national, owned by comedian Rose Ouellette, operated every day with a full house. Jean Grimaldi's theatre did just as well in 1953, with 3 500 spectators daily. Cabarets that came into being between the wars also showcased humour. But burlesque and the world of cabarets began to decline with the arrival of television. Like society, humour evolves and changes. During the burlesque era, humour mocked the established order and authority, much to the great displeasure of the Church. With the Quiet Revolution, it was even more engaged and anti-establishment. The leaders of this type of humour were surely Les Cyniques. Their name fit them perfectly. 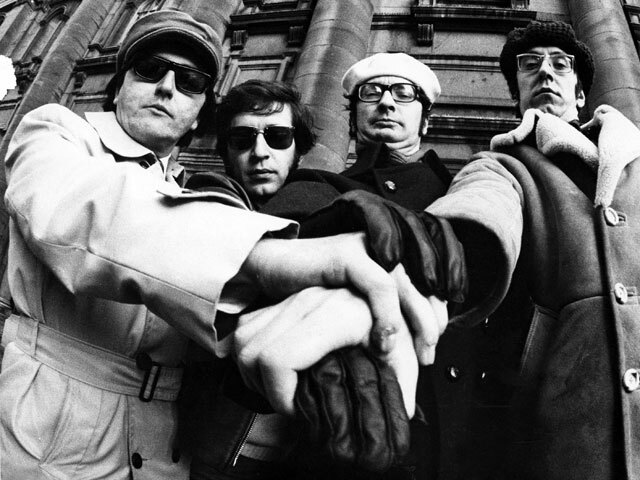 Adjectives used to describe the humour of the quartet originating from Collège Sainte-Marie at the dawn of the 1960s were many: scathing, caustic, biting, irreverent and vulgar. And if that were not enough, they swore blithely on stage; one skit was even specifically about this theme. Les Cyniques spared no one: politicians, public personalities, members of the clergy, homosexuals, police officers and ethnic minorities were all targets. Nothing was taboo to them. According to Robert Aird, author of a book on the history of humour in Quebec, they were masters of the art of social satire. Les Cyniques were not the only humorists to address subjects that were taboo. Clémence Desrochers did the same, but using an entirely different approach. For a long time, females acted as foils in the field of humour. One need only think of Juliette Pétri, Manda Parent and Rose Ouellette, to name but a few. At the end of the 1950s, Clémence was the first female to go on stage and tell stories about a roster of charming and anonymous personages like housewives, female factory workers, passengers and waitresses. She addressed delicate issues like the obsession with weight, sexism and menopause. Even before the term feminist existed, she talked about women and their conditions with subtlety and affection. The person known to everyone simply as Clémence is considered to be the first humorist to do social monologue.